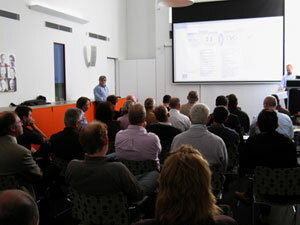 A series of national workshops on Building Information Modelling (BIM) wound up in Perth on 5 November. CRC project team members facilitated the workshops, with Tom Fussell (Queensland Department of Public Works) providing on overview. This was the last in a series of open forums for industry consultation and feedback on the development of The National BIM Guidelines. Attendees were encouraged to critique the draft and to come with comments and questions. The Guidelines are based on experience and practical examples that promote consistency in the implementation of digital models for building and infrastructure projects. The Guidelines will be informed by lessons learnt from case studies where integrated, digital models have been developed. The BIM Guidelines will support stakeholders in achieving interoperability throughout the lifecycle of the facility and will be based on internationally accepted standards. One of the major project goals was to highlight open and consistent processes allowing any practitioner to work with any other practitioner in developing shared “virtual buildings and infrastructure” projects.